FACT CHECK: Did Congress 'Set Aside' $50 Billion in 2006 for the Construction of Border Fencing? When some leading Democrats voted for the Secure Fence Act, were they agreeing to 10 times more funding than President Donald Trump requested for his border wall in 2018? By passing the Secure Fence Act in 2006, U.S. Congress members were voting to allocate or set aside $50 billion in funding for border fencing. One 1999 analysis provided cost estimates for border fencing which suggested that over 25 years, the cost of building and maintaining 700 miles of double-layer border fencing (similar to what the Secure Fence Act called for) could be between $11.5 billion and $49 billion. The Secure Fence Act did not authorize, allocate or "set aside" any funding. Furthermore, $49 billion was a "worst case" estimate for the possible 25-year cost of the border fencing, and lawmakers did not appear to have considered that analysis before casting their votes on the Secure Fence Act in 2006. During the U.S. federal government shutdown that began in December 2018, President Donald Trump and many of his supporters blamed Congressional Democrats for the budgetary impasse. As part of that rhetorical battle, Trump and others accused Democrats of hypocrisy and political opportunism, alleging that their current opposition to providing funding for the president’s long-promised border wall was in stark contrast to their past support for border security infrastructure. The figure of $50 billion was especially significant because it was a far greater sum than the $5 billion for border wall construction which President Trump demanded be included in the 2019 federal budget, and which formed the crux of the partisan standoff and ensuing government shutdown. The “$50 billion” message was shared widely on Twitter and Facebook, prompting inquiries from readers about its veracity. 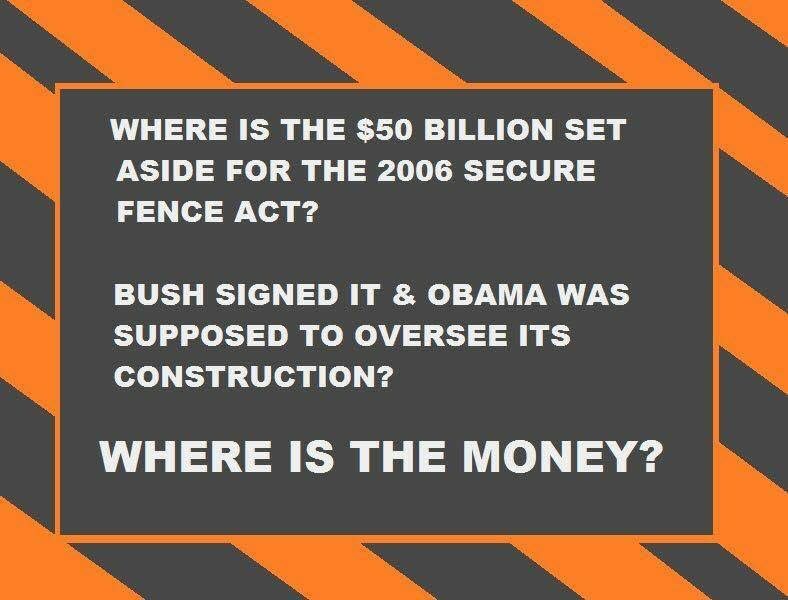 In reality, $50 billion was not set aside for border security infrastructure as part of the 2006 Secure Fence Act, and therefore no misappropriation of such funding occurred. One analysis, which predated the Secure Fence Act by seven years, predicted that building and maintaining the type of border fencing provided for in that legislation might cost up to $49 billion over the course of 25 years, but that analysis did not play a significant role in Congressional deliberations before the passing of the Secure Fence Act. In the context of the 2018-19 controversy over President Trump’s proposed border wall, Republicans made claims about the effectiveness of that border fencing in reducing illegal border crossings into the United States. In a previous fact check, we found such claims to be vague and flawed. Some Democrats supported the bill, and some didn’t. In the House of Representatives, the Secure Fence Act passed by 283 votes to 138, with 64 Democrats voting in favor and 131, including Nancy Pelosi, voting against it. In the U.S. Senate, the bill passed 80-19. Some 26 Democrats supported it, including future president and vice-president Barack Obama and Joe Biden, 2016 presidential nominee Hillary Clinton, and future Senate Minority leader Chuck Schumer, while 17 Democrats, including future Secretary of State John Kerry and future Senate Majority leader Harry Reid, opposed it. The claim that Congress “set aside” $50 billion for border fencing in 2006 appears to have been derived from a 1999 study conducted by the U.S. Army Corps of Engineers. No, that statement wasn’t made by a Republican. It was a speech given by then-Sen. Barack Obama of Illinois in 2006, when 26 Senate Democrats — including Obama and Sens. Hillary Clinton and Chuck Schumer of New York –- voted for The Secure Fence Act, which allocated $50 billion over 25 years for 700 miles of fencing along the border. The report cites a Corps of Engineers study that estimates construction of the fencing would cost about $1.2 to $1.3 million a mile, in addition to costs for labor and for purchasing the required property. Further, the Corps of Engineers estimates that maintenance of the fence over its 25-year lifespan would cost between $16.4 million to $70 million per mile, depending on the frequency and strength of attempts to cross it. 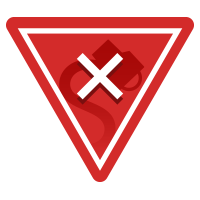 Because border fencing is a relatively new and limited phenomenon along the U.S.-Mexico border, there is a dearth of information concerning its overall costs and benefits. The Corps of Engineers study predicted that the costs of constructing a double layer fence consisting of primary fencing and Sandia fencing would range from $1.2 million to $1.3 million a mile. The Corps of Engineers also predicted that the 25 year life cycle cost of the fence would range from $16.4 million to $70 million per mile depending on the amount of damage sustained by the fencing. If significant portions of the border were to be fenced, reducing the areas along which individuals could cross the border, it may stand to reason that the fencing will be subjected to more breaches and other attempts to compromise than the fencing that has already been constructed. This may mean that the costs of maintaining border fencing that is widely deployed in the future will be higher than they have been thus far for the limited deployment. The double-layer fencing envisioned in the Secure Fence Act was expected to stretch for a total of around 700 miles. 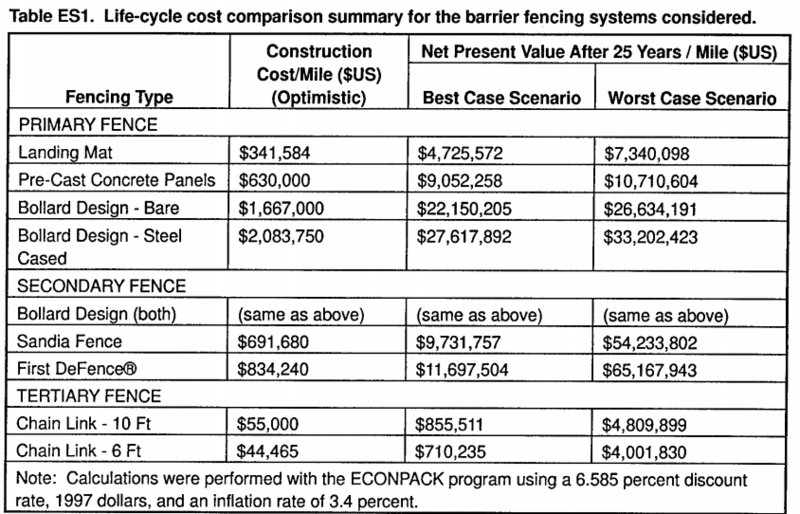 If the “25-year life cycle cost” of the fence was between $16.4 million and $70 million per mile, that would equate to a 25-year cost of between $11.5 billion and $49 billion. That “worst case” estimate of $49 billion over 25 years is the source of the “$50 billion” claim which was promulgated in 2007 and 2008, and then again in 2017 and 2019, amid the controversy over President Trump’s border wall proposals, and Democratic opposition to them. The existence of the 1999 Corps of Engineers study shows that, at the time lawmakers voted through the Secure Fence Act in 2006, one analysis from a reliable source included estimates that indicated the 25-year cost of a 700-mile double-layer fence along the southern border (such as that envisioned in the Secure Fence Act) could range from $11.5 billion to $49 billion. Furthermore, a Congressional Research Service report which reiterated those findings was published on 21 September 2006, too late to be taken into consideration by U.S. Representatives, but before their Senate counterparts cast their votes. However, these estimates (the source of the “$50 billion” figure) only appear to have attracted attention and gained traction after the passing of the Secure Fence Act (for example in the January 2007 Migration Policy Institute analysis), rather than beforehand. In a debate about the bill on 29 September 2006, for example, several U.S. Senators offered varying estimates of the likely cost of the fencing envisioned in the Secure Fence Act. None of them mentioned a figure of $50 billion, or even close to that. In fact, no member of either house of Congress mentioned either the figure of $50 billion nor the original 1999 Army Corps of Engineers study during any debate about the Secure Fence Act. The House has passed and the Senate is debating legislation to build 700 miles of fence on the U.S.-Mexico border with no certain idea of how much it would cost. Estimates range from $2 billion, cited by Sen. Judd Gregg, R-N.H., chairman of the appropriations subcommittee for homeland security, to $7 billion, the figure used by Senate Minority Leader Harry Reid, D-Nev. Homeland Security officials told congressional aides it would cost about $5 billion. The department would not confirm that figure nor address the cost of the 107 miles of fencing already up along the nearly 2,000-mile border. The cost can vary depending on whether the government or a private contractor builds the fence. So while it’s true that the Army Corps of Engineers study was publicly available when Congress passed the Secure Fence Act in 2006 and could have proved instructive to the debate around the planned construction of border fencing, no evidence suggests that either document played a part in the considerations or deliberations of lawmakers before they cast their votes. This is worth bearing in mind when evaluating any claim that lawmakers (particularly Democrats now hostile to President Trump’s border wall plans) passed the Secure Fence Act despite estimates which placed its 25-year cost at $50 billion. Finally, the more specific claim made in the meme and by Rep. Scalise, that the Secure Fence Act “allocated” or “set aside” $50 billion over 25 years, is false. In fact, the Secure Fence Act did not authorize, allocate or “set aside” any funding. In 2017, the Government Accountability Office (GAO) reported that the U.S. Customs and Border Protection agency (CBP) had spent $2.3 billion on building 654 miles of border fencing between 2007 and 2015, and that CBP had projected in 2009 that the cost of maintaining its border fencing for 20 years would be $1 billion. Fox News. 2 January 2019. The Boston Globe. 27 January 2017. CQ Researcher. 19 September 2008. Migration Policy Institute. 15 January 2007. Congressional Research Service. 21 September 2006. U.S. Army Corps of Engineers, Construction Engineering Research Laboratories. February 1999. The Washington Post. 25 September 2006.